I know this is something I should have done long ago! Everyone looks at me in disbelief when I tell them I never applied for my Pro Cards. I always put it off & when I did apply, they told me to apply online. It is weird because at the time there was no way for me to apply online. I have my entire kit setup so I felt like getting a Pro Card was a waste since I didn’t really need to buy much makeup. What a mistake! I ended up spending so much money & ontop of it I made a mistake when applying for my pro card which I want you to avoid. Before you apply for your pro cards..make sure you read the benefits. It is good to know. 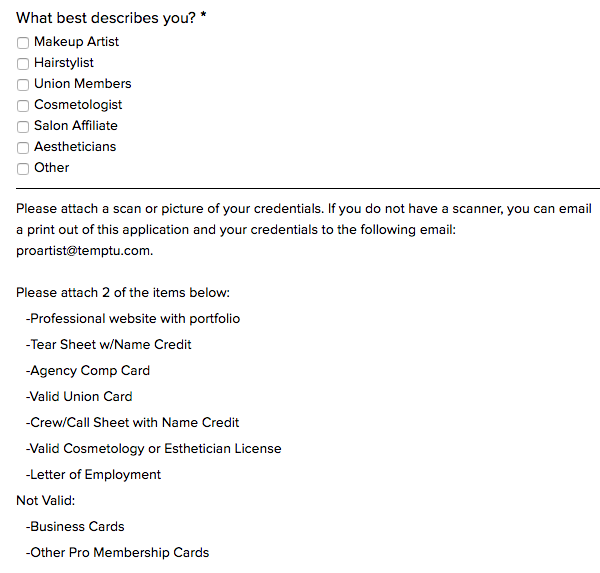 For example…M.A.C offers 40% discount when you apply for Pro Membership as a MAKEUP ARTIST. If you apply only as a COSMETOLOGIST, you only get 30% off. I was so annoyed when I realized that after already submitting my application, technically I am both. I went to school for cosmetology & makeup artistry is included in the curriculum. However I am a Makeup Artist. You can apply for your MAC Pro Card HERE. Make sure to take your time to fill out the application instead of rushing like I did. Remember they do charge you a fee of $35 for a yearly membership & a fee of $65 for a 2 year membership. Another Pro Card I applied for is Temptu. If you aren’t familiar with this company, do so now! They are the top airbrush company in the world. These are the discounts that they offer & I just applied for the Artisan Level Discount. You can apply for their Pro Card HERE. I would have saved so much money if I had applied for this years ago. Please go do yourself a favor & apply now lol.